Every woman needs a business card! When you enter the site it will say the following: My Card Are you a Betty? with that famous trade mark of a Yellow pony tale, Betty's all American personality that synonymous with Apple Pie is the scent that makes one smile, the other side her nemesis Veronica lodge and her blue highlights flaunts a mean perfume that's has everyone inhaling her wealth and flamboyant personality. That is my business card and everyone wants it and talks about it. YOU too can create that buzz! Business cards for the smart stylish women. You need to create a slogan for yourself, your favorite color and find that fun scent that get others to talk about who you are! These cards create conversation, networking and an impressive statement on who you are. Business women know the power and importance of connecting and networking, an exchange of a card leads to future roads. 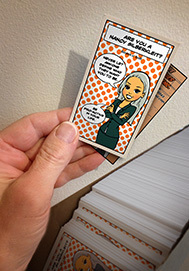 Business cards are not only limited to working women. Stay at home moms are climbing onto the business card bandwagon of cards. They lead to future play dates, meet ups and new friends.